Hetain Patel is best known for his humorous performances which draw on storytelling to investigate shifting forms of identity. His works, which probe his own familial relationships and reference music, cinema and cartoon characters, are inspired by the ironies and peculiarities of experiences of migration and diasporic upbringing. 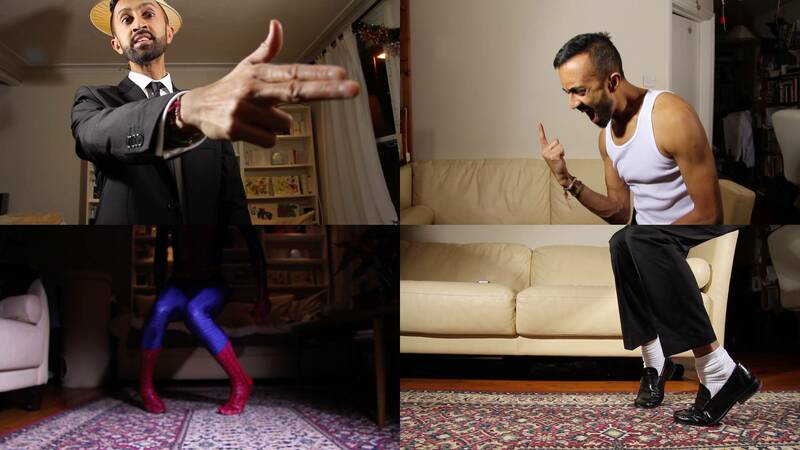 In The Jump 2015, Patel wears a homemade Spider-Man suit — the only superhero costume he found where he could completely cover his skin and not appear as the Asian or Indian superhero. 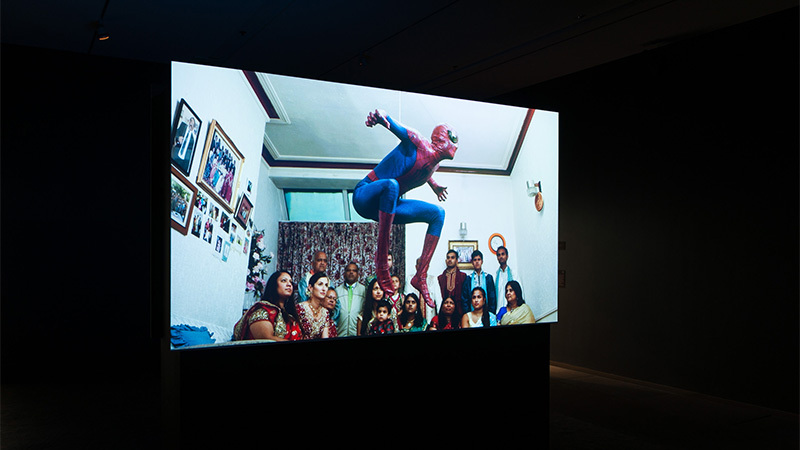 The cinematic installation features Patel leaping in the air in slow motion from a squatting position — both the characteristic stance of Spider-Man, and a common pose in many Eastern cultures. It is staged in Patel's grandmother's living room in Bolton, the same room in which Patel spent the first five years of his life and where each member of his extended family stayed when they first immigrated to Britain. Through the recontextualisation of cultural motifs and the contrast between fantasy and reality, Patel shows the continually fluctuating and constructed nature of the self. Hetain Patel has also worked with the QAGOMA Children's Art Centre to develop a project for APT8 Kids. 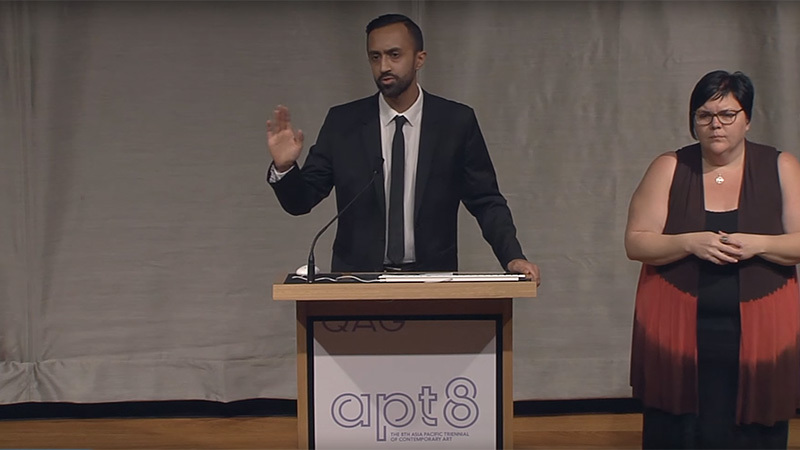 Hetain Patel presents Be Movie 2.0 2014–15, a performance lecture that offers an alternate version of Barack Obama’s Nobel speech of 2009, with the artist imitating a number of real and fictional characters from world politics to popular culture. 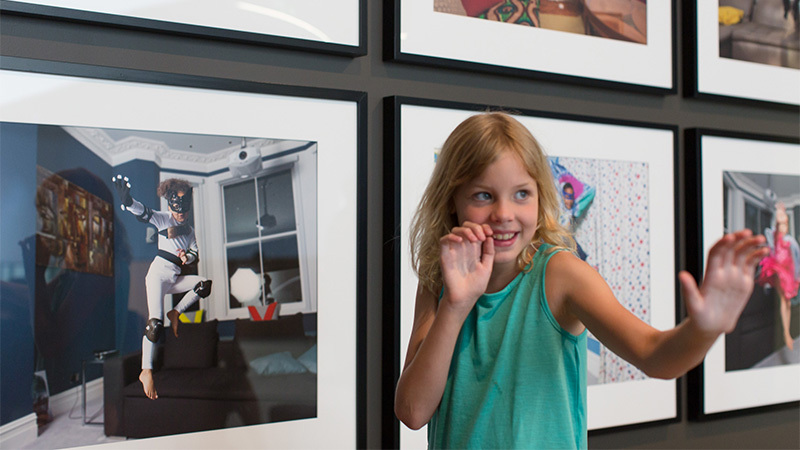 Hetain Patel presents a series of photographs of children dressed in homemade superhero outfits jumping into the air in Kids APT8. Hetain Patel , United Kingdom b.1980 / The Jump 2015 / Two-channel HD video installation, 16:9, colour, sound, ed.of 5 / Courtesy: The artist and Chatterjee & Lal, Mumbai / © The artist. Hetain Patel , United Kingdom b.1980 / The Other Suit 2015 / Four-channel HD video installation, 16:9, 4:42 minutes, colour, sound, ed. of 5 / Courtesy: The artist and Chatterjee & Lal, Mumbai / © The artist.